West Jakarta, SDN 03 and 04 Kembangan Selatan students are enthusiastically read and pick some books from mobile library car that visit their schools on Thursday (4/4). 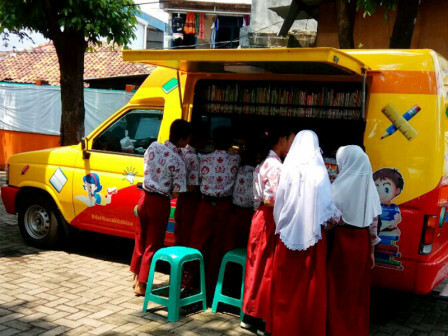 This West Jakarta Library and Archive Sub-department (Sudinpusip)'s mobile library car is routine to provide free book access for public every week from 9 AM to 3 PM.
" In this car, we provide around 700 book collections for children, teenagers, and parents"
Ivanya Grace, 4th grade student of SDN 03 Pagi Kembangan Selatan stated, she is happy with this mobile library service because she can read story books. "It is very fun to read story books. The librarian is also kind because we are allowed to borrow books that we haven't finished reading," she expressed. Based on Beritajakarta.id monitoring on the field, students are queued to fill the attendance list before reading the book which are stored neatly in the car. Ferdi, West Jakarta Sudinpusip's Mobile Library Car officer stated, there are around 170-200 students who visit and read the book in his visit to SDN 03 and 04 Kembangan Selatan. "In this car, we provide around 700 book collections for children, teenagers, and parents. Most of the visitors are students who usually borrow books when we visit their schools," he con veyed.